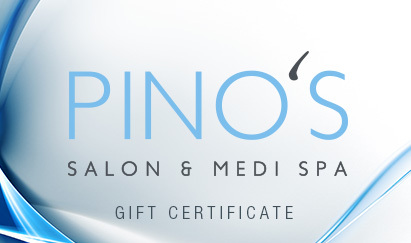 Lavish your friend, colleague or family member with a Gift Certificate at Pino’s Salon & MediSpa. Over the phone, in which case we can take payment with either Visa or MasterCard. In salon at time of pick up. When purchasing a spa package or service we encourage our clients to use the package within a year. This guarantees our prices for the services included on the certificate. One year after the date of purchase, the package will automatically convert to a dollar amount. The gift recipient can apply the dollar amount to any service or product. A gift certificate purchased for a dollar amount, can be redeemed at any time.